Cold Laser Therapy is highly effective. The therapy is photochemical (cold), not thermal (hot). Hot lasers in the medical world are used for surgical precision while cold lasers are used for healing precision. Cold Laser Therapy is a major, cutting-edge advancement in healing and is rewriting the medical books on what is possible for chronic injuries, pain management, neurological impairment, and facilitating the healing process in disease conditions. 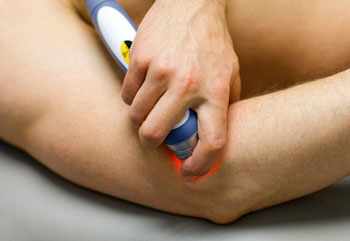 What Can Cold Laser Therapy help with? The Cold Laser accelerates cellular reproduction and growth, and as such, actually stimulates the body to heal. Increased metabolic activity helps the body increase output of specific enzymes, and increases oxygen to blood cells, which creates a greater immune response. Cold Lasers increase healing time from injuries, and increases and stimulates the healing of disease conditions. Cold lasers also reduce fibrous tissue formation. Studies show the reduction of scar tissue following laser treatment. Laser treatments are the most effective in a series of 5-10. As many as once per day, or as little as once per week will begin the healing process. Clinical studies have shown some patients may experience relief immediately. Your Doctor will evaluate and recommend as needed. Since laser therapy is a global/body-wide treatment, many patient s have also experienced improved conditions which were not treated with a laser. Ease of movement, greater strength, less pain. As with all healing modalities, patients respond at different rates and have different sensitivities. Some patients feel mil warmth, while others feel nothing at all. These are all normal, and the laser is working whether the patient can feel any sensation or not. Cold Laser treatments typically take less than 10 minutes. There is no downtime after a treatment. Cold laser therapy is simple to add into a busy schedule. How can I maximize my laser therapy? Laser treatments are most efficient when the patient is well-hydrated, because the laser’s photon travels through the body’s water molecule. It is also helpful when a patient has a diet of “good”fat, and refrains from “bad” fats or hydrogenated fats. Is Cold Laser Therapy expensive? Cold laser therapy at Arsenault Family Chiropractic Center is affordable. Treatments are $25 each.